Odissi’s beautiful form echoes in her name. The roundedness of the O and its meditative sound remind me of the cosmic sound of OM. The rest of the word after O in Odissi is a tongue twister. In hindi and oriya the ‘d’ would be pronounced with its characteristic twisted sound. Culminating in the ‘issi’ the word Odissi seems to free itself of form, flowing like the sea, like forms of nature, forever feminine and curvilinear. Indeed such a beautiful name for the most feminine, sculpturesque, earthy Indian dance that best represents the curves of nature. It is as if Odissi ‘knows’, just like ancient Indian sculptors did, that mother nature exists in curves. In trees and forests, in the waves of the sea and the waxing and waning of the moon. Even in the human body. In its shape of the eye, the grace of the neck, the bend at the waist down to the arch of the feet. Odissi celebrates these curves that exist in the human body, in the entire cosmos and places them in between the axis of the horizontal and vertical. Do our spaces exist only in the horizontal and vertical, or are there infinite divisions of spaces in between, that seem to defy these two dimensions? Odissi smiled at me and exploded with a vocabulary of infinite possibilities of space in Guru Surendra Nath Jena’s style. She flowered like mother nature and every time I danced I felt myself flower, marveling at the feeling of embodying these spaces. 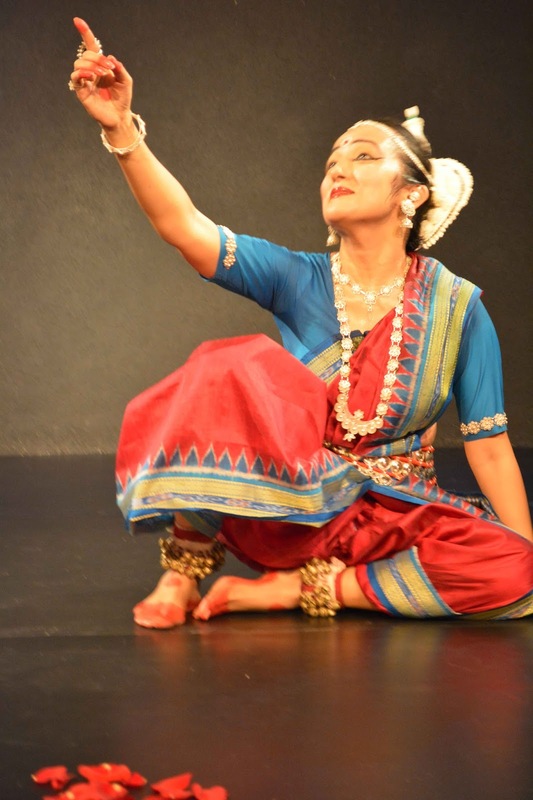 What happens when one moves in Odissi? The body learns to flower and flow in new ways. It finds that movement is not just of the nature of standing, sitting and lying down, but that the human body can burst like a riot of colours onto the canvas of space. One’s body is the paint, the brushstrokes of the artist, and the forms one creates change. Change like the speed of one’s thoughts, like the waves of the sea, forever intangible and timeless. Odissi helped me also experience the nature of time. With her my mind travelled so many time zones in seconds, it was like magic, a wonderful way to be with Krishna or experience the magnificent yogic state of Lord Shiva. And as I refer to Odissi as ‘she’, I know Odissi is all woman. She epitomizes the feminine principle. With all her beauty and shringar, she also has the immense power of the feminine creative source. She is akin to nature in all her curvilinear forms and never afraid to express all her emotions reveling in all the Navarasas. She is so pregnant with meaning and beauty, it is as if she holds within her the seed of all creation. She leads us with her gentle ways to the higher source, as if our meeting was only for a reason, to connect us with the divine. Thanks for sharing the information about the classical dance.